You know that feeling when a teacher asks the class, “Do you need me to explain? Raise your hand if you don’t know what ____ means.” You look around, not wanting to be the only person unfamiliar with the term. Well, a most unexpected thing happened at a conference recently: a panelist in a session on gastrodiplomacy began speaking about the “free produce movement,” and I was shocked to discover that apparently very few of us (if any) in a room full of experts in food studies had heard of it. Michelle Branch, of New York University School of Law, was presenting her work, “Free Produce Societies as Agents of Diplomacy” at an annual conference that convenes thinking about food, society, and values, hosted by Chatham University. She explained that the free produce movement was an early food justice movement propelled by Quakers and other abolitionists who hoped to abolish slavery through food ways in 19th century America. Their basic strategy was to avoid slave-made goods and instead purchase items made by “free-labor.” As a result, money would not ultimately end up in the pockets of those who were capitalizing on slave-labor, thereby supporting slavery indirectly. 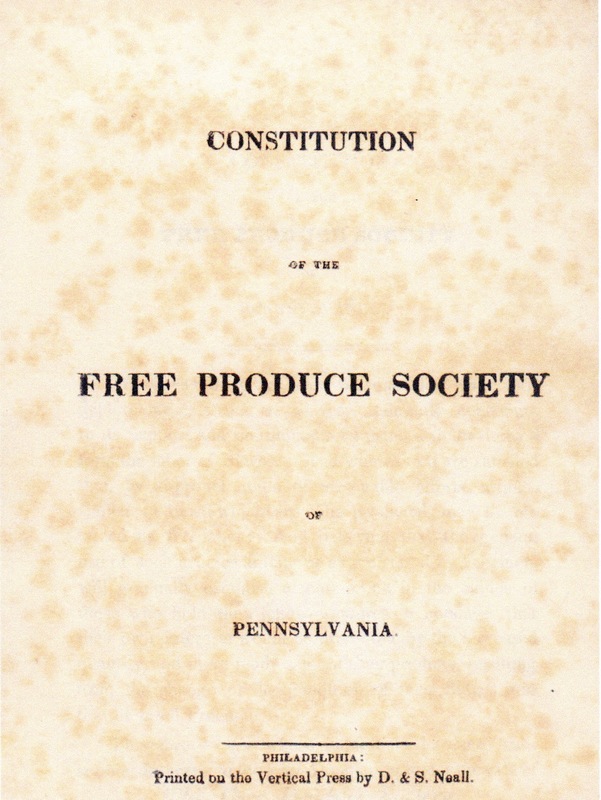 The free produce movement was more specifically intended to champion anti-slavery agriculture, known as “free produce.” The term “free” was not related to monetary cost but to the concept of freedom, as they envisioned an alternative market not so intertwined with slave-labor and in which people paid a fair price for produce. Some of the promotion strategies used by the free produce movement included making non-local foods suspect and changing discourse to increase awareness surrounding food. Mindfulness and transparency were encouraged. Additionally, they sought to go beyond boycotting by making substitutions that would support the cause. For example, cane sugar (widely produced by slave labor) could be substituted with maple syrup from Vermont, which was a no-slavery state. Private markets were established where shoppers could purchase items certified as free by the merchants who had traced the food’s origins to the local labor conditions. According to Branch, at that time people were expressing less interest in the origin and history of food and the food system. The expansion of trade had made new foods accessible and less expensive, and this shift of focus meant the slavery issue was not an item of great concern. It struck me how similar our detachment from the current food system is from that of nearly two centuries ago. The prevalence of cheap, convenient, “24/7” access to an endless variety of foods invites us to consume without pausing to consider how it got to our plates. While it is true that slavery in America was abolished in 1865, it is very much still present in the conditions of modern food production. Films like Food Chains, The Harvest, and The Price of Sugar have helped shed light on the issue of farmworker justice. Although the free produce movement was ultimately considered a failure, it seemed to foreshadow other displays of consumer activism surrounding human rights injustices in agriculture. For example, Branch suggested the movement might be considered the ”intellectual ancestor” of the widely recognized Fair Trade movement and Fair Food program. There remains a need for transparency in the food system, which is infinitely more complex than 200 years ago. Perhaps, like me, you had never heard of the free produce movement until now and perhaps this is the first time you’ve considered how your food dollars could reach so far as to support fair or unfair working environments. I encourage you to try purchasing more ethically produced goods if ever given the option, as the ability to choose is an all too often overlooked freedom. 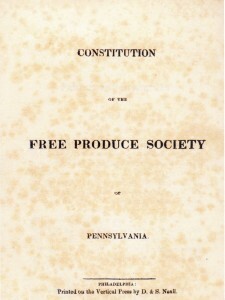 Image: Cover page of the Constitution of the Free Produce Society created in 1827.